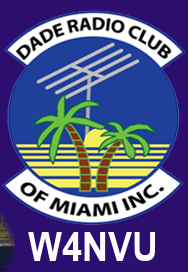 July – W4NVU – Dade Radio Club of Miami Inc.
Meeting was called to order at 19:32 with 24 present. We have a quorum. The minutes were posted on the website. A motion to accept the minutes as posted was made by Brendan, seconded by Merritt. Corresponding Secretary: Lloyd stated that there was nothing in the mailbox. Treasurer – Brianna is not present tonight. Lloyd announced that dues are due. We need to do things for the club. Go online. It’s only $35.00. Ryan is not here tonight for the Website. Club Elmer/PIO – Miguel is in the other room with testing. Merritt spoke about the Hambulance and the progress that has been made and what still needs to be done. It was used for Field Day and it worked. It was hot during the day. Lloyd suggested covering the front windshield. Jason stated that there was no news on the Tower project at this time. Lloyd spoke about Field Day. Steve is not here tonight. Lloyd thanks everyone that participated. He showed a picture presentation. We also had a mini flea market inside. Club Elmer/PIO – Miguel came out of testing. At Field Day we had 103 Country there and we got extra points. We got extra points again this year for Joanne – she is an elected official. Thank you Joanne. Next year we want to make another contact with the ISS station with another school. If you want to volunteer for that, please contact Steve. Nothing else. Hamboree – Lloyd is the chairman for 2016. This will be our 50th Year Anniversary. He needs help. We had a great show last year. We still have no location. If you have any suggestions, please send them to Lloyd. It is going to be sanctioned by the ARRL because it’s our 50th year. Yeasu and HRO are on board to come. Numerous suggestions were made by the members of potential places and Lloyd will check them out. It was discussed that we should honor Evelyn. She started the DRC. David will check on her status. The 147.000 – Jason advised that there is nothing new. Needs a tower guy. The 147.760 – Ray advised it is still there. Rumor is that we may have to move it. The 444.200 – Carl stated that it’s working great. Digipeater 144.390 – no new information. D-Star – was coordinated by Julio. Its up and running. Better than before. Ray announced that if anyone knows a building manager of a building more than 30 floors to let us know. We need new homes for some repeaters. Emergency Committee – Miguel advised that all is good and quiet. Ray stated to check out “hurricanechecklist.com”. Virgil stated to make sure you change the oil in the generator. Ray stated that the oil needs to be changed every 24 hours. Net Manager – Brandon stated that the nets are every Wednesday. We need some other members to run the net on Wednesday nights. It only takes about 30 minutes. Please email Brandon if you are interested. Mike came out of testing and announced that we have 2 new Techs, Rudy Suarez and Jaime Aruel. He is a Ham in Spain. Congratulations!!!! Virgil announced that the Everglades Club is putting up 2 new repeaters. Miguel announced that there is a new DMR repeater at Jackson. Brandon made a motion to adjourn, seconded by Ray. The DRC meeting was adjourned at 20:31.